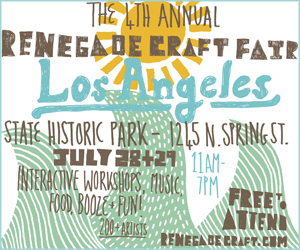 Join us on July 28th & 29th for the Renegade Craft Fair, at the Los Angeles State Historic Park (aka the Cornfields). The fair will be from 11am - 7pm both days, and we'll be there with bells on - and with cool kits, patterns, a sample sale, pencils, handouts, class info... super fun! Click on the link above for more info, directions and all the amazing artists who will be in attendance!